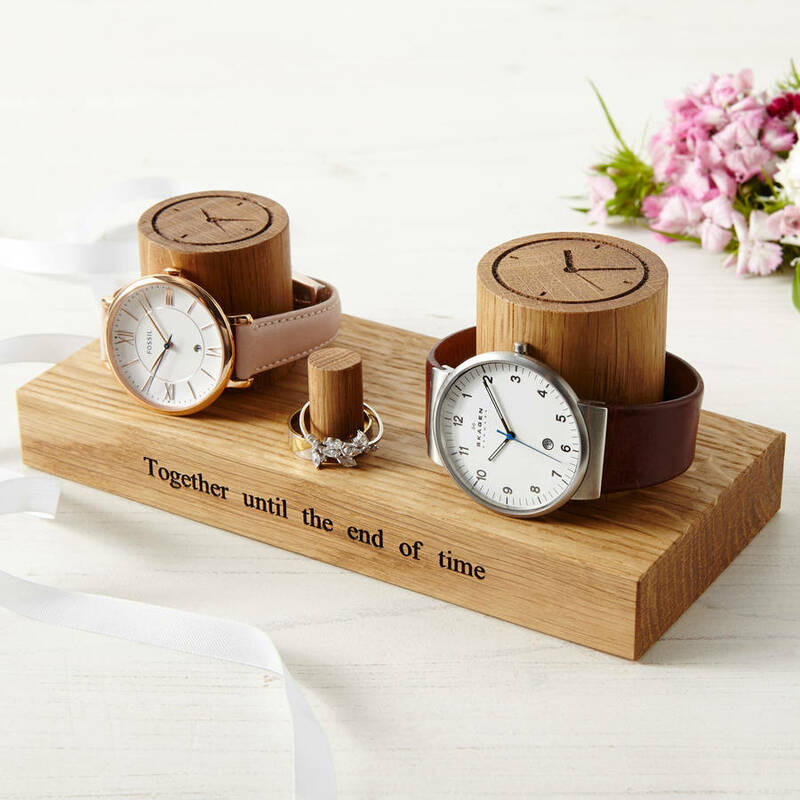 A stunning handmade Personalised Couples Wooden Jewellery Stand making a lovelly romantic Valentine's or 5th Wedding Anniversary gift for a couple or loved one. 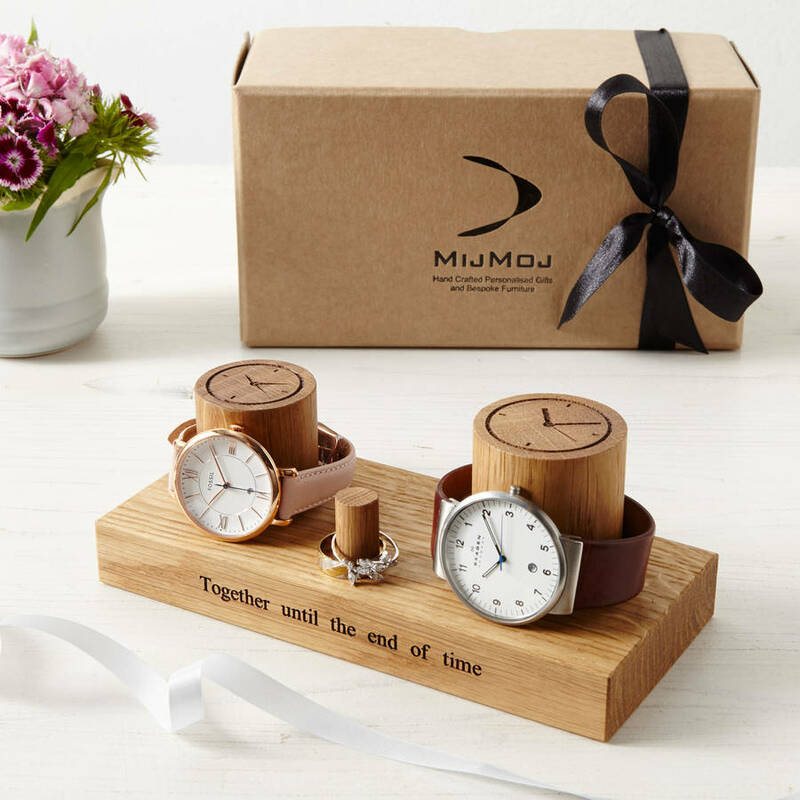 Lovingly hand-crafted in our studio workshop this personalised couples watch stand with romantic 'together forever' ring stand makes a beautiful addition to any bedroom dresser and is the perfect alternative to the more traditional watch or jewellery box. 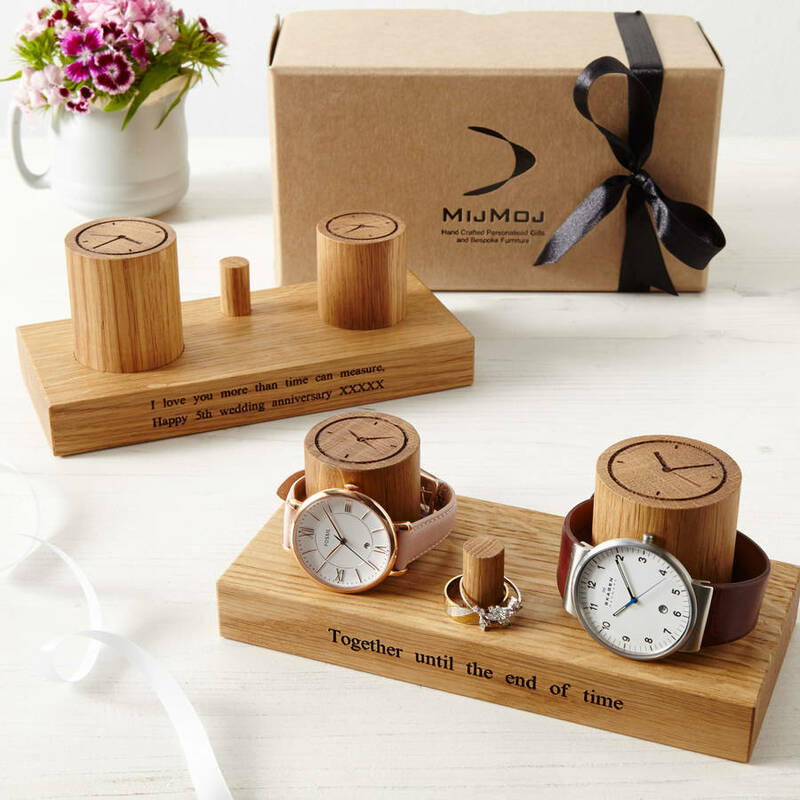 This is also a truly unique Wedding, birthday or Christmas gift for that special someone or romantic couple. 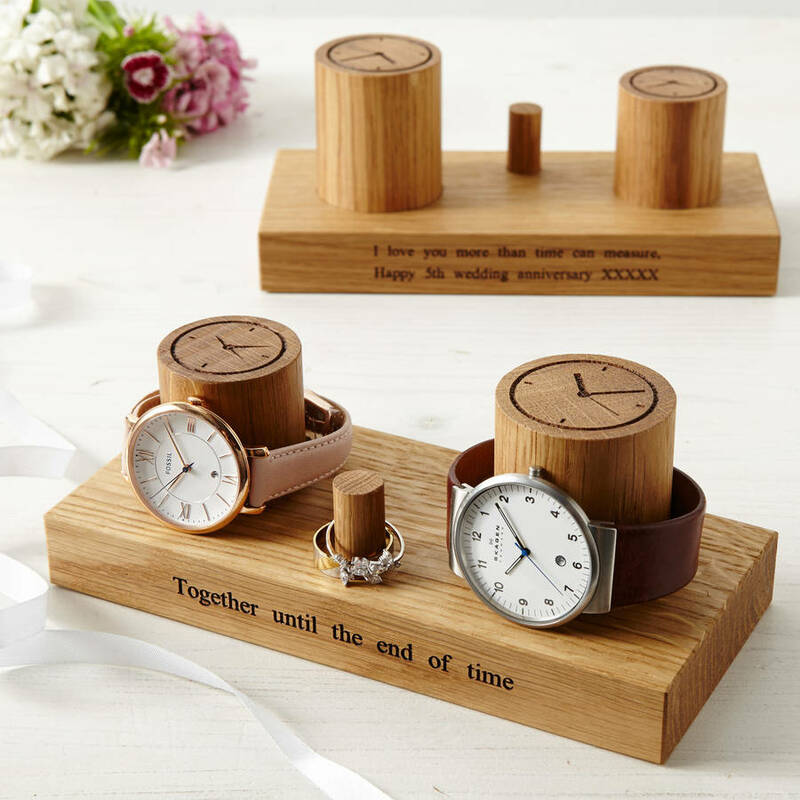 It can be enhanced and personalised by adding a special message with a play on 'time' perhaps to remind you or your loved one of special times and what’s really important in life! 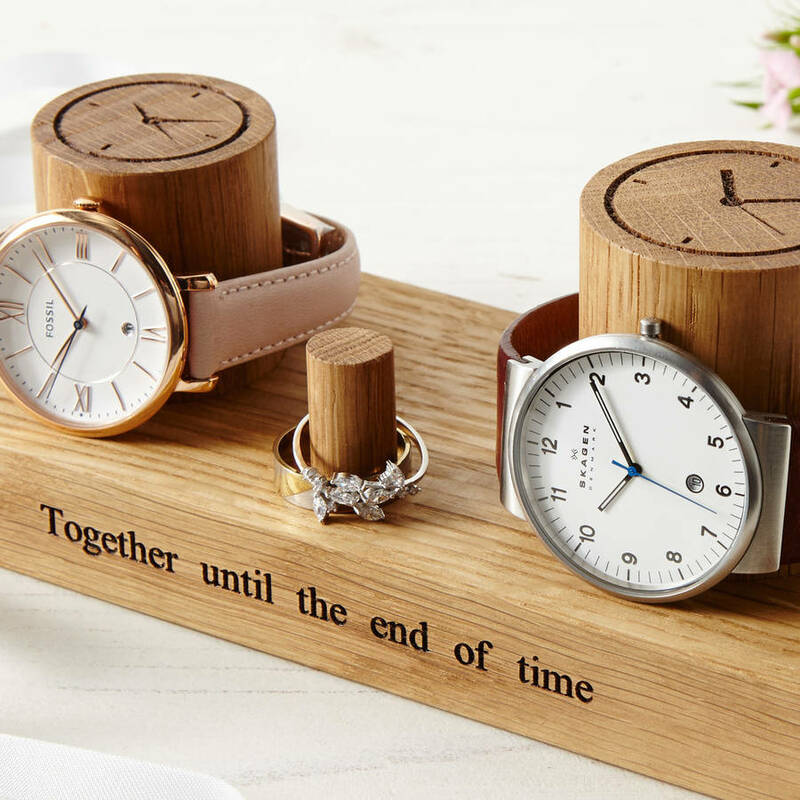 So why hide your beautiful watches and rings away in a drawer or box where they can't be seen, when they can be romantically displayed and give that warm feeling and add a smile each morning when you select to wear. The larger watch stand column diameter is approx. 45mm (2”) diameter. The smaller watch stand column is approx. 38mm (1 1/2") diameter. PERSONALISATION: A perfect gift for a ‘Wedding Anniversary’ or 'Valentine’s Day' add our suggested engraving 'Together until the end of time' or ‘Always have time for you’ or ‘Time is precious’ or your own unique message special to you. HIDDEN SECONDARY MESSAGE: There is also the option to add a hidden, secondary engraving to the back face where you can include a longer message to make it that extra bit special and meaningful. Solid natural oak with laser engraved detail finished in grain enhancing oil. 180mm (L) x 80mm (D) x 75mm (H) approx.